Superman’s NFL draft profile, plus scouting reports for Spider-Man, Hulk, Toad, and more. Illustrations by Natalie Matthews Ramo. Overview: Refugee from dying planet, immigrated to Earth as young boy. Absorbed power from sun, transforming into edge rusher. Daily Planet first-team All-American. Registered 345 tackles, 85 sacks, and 14 reversals of the Earth’s rotation. Missed two games due to adverse reaction to glowing green substance. Strengths: Plays bigger than his size. Massive upper body strength makes him unblockable at times. Vertical is off the charts. Can really fly. Exhales freezing air and releases bursts of heat from eyeballs. Weaknesses: Questions about level of competition in Smallville. NFL scouts voice concerns about commitment to football. 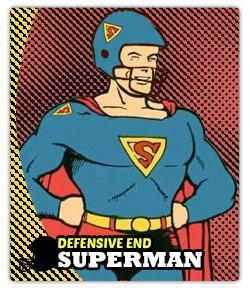 Will take plays off, telling coach he has to “save the world.” Loner, often retreats to Fortress of Solitude. Lacks killer instinct—believes injuring opponents is immoral. Refuses to undress in front of teammates. Died in 1992, so durability is a concern. A bit stiff in the hips. Draft outlook: Generational prospect. Likely No. 2 selection behind Jadeveon Clowney. Overview: Orphaned when parents killed in plane crash. Bitten by spider irradiated by particle accelerator, developed arachnid-esque agility and climbing prowess. Wracked with guilt after allowing uncle who raised him to be murdered by an intruder. Led conference in interceptions. Once punched a dinosaur so hard that it lost consciousness. Strengths: Excels in press coverage—always sticks to his man. Catches balls at their highest point. “Spider-sense” allows him to undercut routes. Unprecedented flexibility due to highly elastic tendons and ligaments. Great power. Great responsibility. Weaknesses: A bit undersized. Some concern that mutagenic spider enzymes may infect teammates. Struggles with zone concepts. Rumors of secret identity could be locker room distraction. Habit of wrapping up receivers with webbing ejected from wrist-mounted shooting device makes him susceptible to pass interference calls. Draft outlook: Top 10 pick, and top defensive back off the board. Cross between Champ Bailey and a mutant spider. Overview: Son of an alcoholic father who murdered his mother. Earned Ph.D. in nuclear physics and developed Gamma Bomb. After bomb detonated in his presence, gained ability to change into gigantic monster. Anger issues. Ejected from every game he’s ever played. Strengths: Great motor. Classic run stuffer who plays with natural leverage. Rare combination of size, speed, and agility. Maintains great pad level despite not wearing pads. Strong hands. Terrifying mean streak. Weaknesses: Emotions can get the best of him. Not coachable. Team that drafts him must install “Hulk Smash” defense. Shreds jerseys and uniform pants at alarming rate, testing patience of equipment manager. Tendency to destroy stadiums could draw discipline from league office. Draft outlook: High first-rounder. More disciplined version of Ndamukong Suh. Overview: Like most players in this year’s draft, his mother was murdered when he was a child. Off the football field, took home first prize in Fallville County Fair Agricultural Competition. Proposed to longtime girlfriend on a Ferris wheel. Shot up prospect rankings after combined lightning strike and chemical spill. Strengths: Superhuman speed. Plays fast with pads on. Great burst off the line and accelerates quickly. Set combine record with 0.00-second 40-yard dash. Speed-reading ability will allow him to pick up new system quickly. Can catch a stray bullet with bare hands. Weaknesses: Needs more polish as a route-runner. Will screw up offense’s timing by running through the end zone before quarterback catches shotgun snap. Invented cosmic treadmill, a time-travel device, but has not figured out how to use it without altering course of history. Draft outlook: Not high on most teams’ boards, but Raiders will reportedly trade up to draft him in first round. Overview: Son of rich landowners. As a child, killed a man with claws that emerged from the backs of his hands. Later, accidentally impaled the woman he loved with same razor-sharp claws. Started every game in his career. Butkus Award finalist. Has played inside and outside. Fluent in Japanese, Cheyenne, and Spanish. Strengths: Disruptive playmaker. Can cover from sideline to sideline. Every-down player. Skeleton bonded to indestructible adamantium. Proven ability to rip out receivers’ internal organs. Quick healer. Weaknesses: Loyalty to team could be compromised by allegiance to Avengers, S.H.I.E.L.D., X-Men, HYRDA, Horsemen of Apocalypse, the Hand, and other shadowy organizations. Though he will recover from most injuries, can be killed if burned with acid. Facing murder charges in multiple jurisdictions. Can be overaggressive at times. Draft outlook: Top of the second round. Fits best in a 3-4 defense in which everyone else is also a mutant. Overview: An orphan, was taunted ceaselessly as a child on account of his freakish appearance. Developed debilitating inferiority complex and subservient personality. Known for poor hygiene. Member of the Brotherhood of Evil Mutants. Strengths: Paralyzes opponents with mucus. Superior tongue strength. Lack of self-esteem makes him extremely coachable. Draft outlook: Likely undrafted free agent, unless defensive scheme requires a toad.